We are focusing our efforts on promoting interdisciplinary research that utilizes various techniques from psychophysiology, molecular physiology, neuroendocrinology, and diagnostic imaging studies to examine the regulatory mechanisms of sleep-wake rhythms and biological rhythms. We are exploring the effects of sleep and circadian rhythm disorders on psychological functions such as cognition, memory, emotion, and motivation and on physical functions including endocrine and circulatory function, metabolism, and appetite. 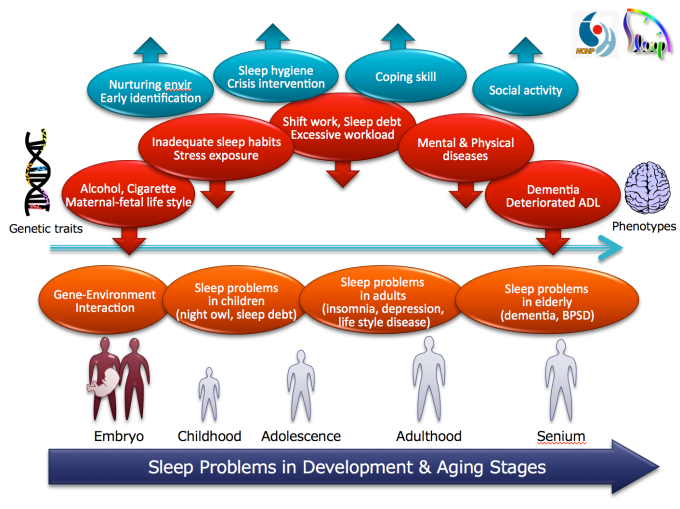 In basic research, we are examining the etiology of sleep disorders in different life stages, from childhood through to advanced age. We are also developing diagnostic and treatment approaches for sleep disorders through clinical trials and medical device development. In cooperation with the Ministry of Health, Labour and Welfare of Japan, we are examining the prevalence of sleep disorders and the side effects of currently available medications in efforts to enhance sleep medicine, including patients’ medical needs. In cooperation with the National Center Hospital Sleep Disorder Unit, we are able to make highly precise diagnoses, offer tailored pharmacological therapy, and provide high quality treatment, such as cognitive behavioral therapy, for sleep disorders.